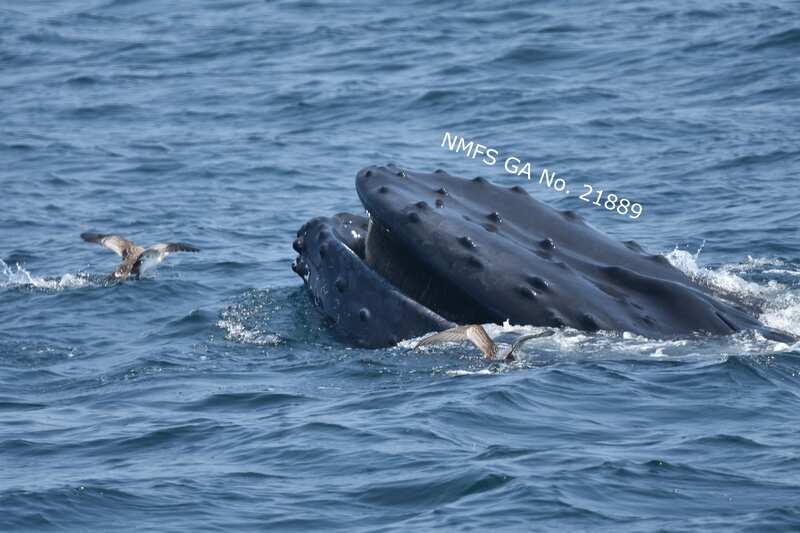 Marine mammal madness in the New York Bight! New York is not typically thought of as a whale watching hotspot, but there are many favorable conditions for marine mammals just off the coast of NYC. Together with the labs of Drs. Janet Nye and Joe Warren from SoMAS, the Thorne Lab began the first of a multi-year string of research cruises funded by the NY Dept. of Environmental Conservation to understand the ecosystem of the “New York Bight,” the ocean region extending outward from New York City and the Hudson River estuary, which encompasses the waters south of Long Island and east of New Jersey. The region provides a number of interesting features that, when combined, create a fascinating environment for many species of marine fauna. Kept relatively warm by the southern Gulf Stream waters, the NY Bight also receives a heavy influx of freshwater and inland nutrients from the Hudson River. The strength of this river can be seen by looking at the bathymetry, or seafloor topography, of the area – the Hudson River has carved a massive canyon along the sea floor as this freshwater (which is denser than seawater) sinks and runs along the bottom. For whales and other species, seafloor canyons can be a rich habitat – as ocean currents run over such bottom features they mix up nutrients that have drifted to the bottom and force them up toward the surface where they can be taken up by phytoplankton. In short, areas with rich bottom features often are areas of high ocean productivity, attracting and feeding all sorts of marine creatures. Above, cetacean sightings and transects covered during our first cruise in July. Cetacean surveys can only be conducted during daylight hours (as indicated by the red “on effort” lines), but fisheries acoustics surveys, fish trawls and carbonate chemistry monitoring were conducted during nighttime hours by our collaborators in the Nye and Warren labs at SoMAS (indicated by the “off effort” purple lines). 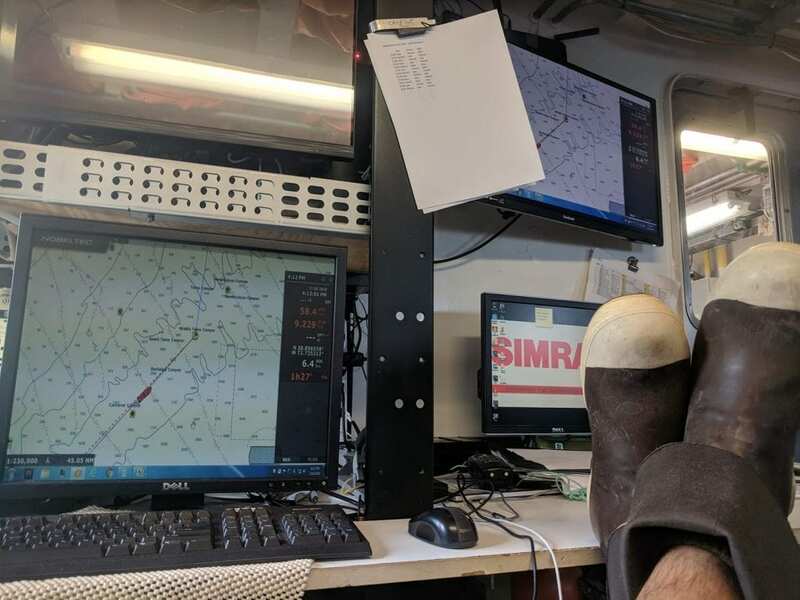 We sailed out of Port Jefferson, on the north shore of Long Island, in the R/V Seawolf, and around to Montauk, where we began our survey effort. 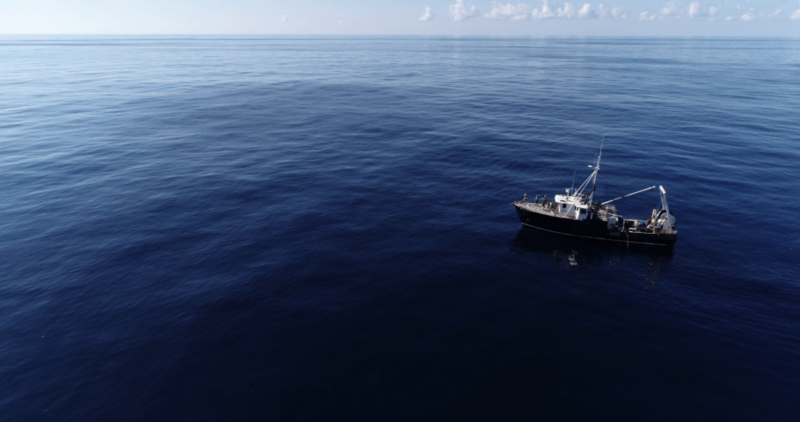 We combined a number of different research methods, including line transect surveys for marine mammals, fisheries acoustics surveys, fish trawls, carbonate chemistry monitoring and Conductivity, Temperature and Depth (CTD) casts, to assess how the many pieces of this vast ecosystem combine. 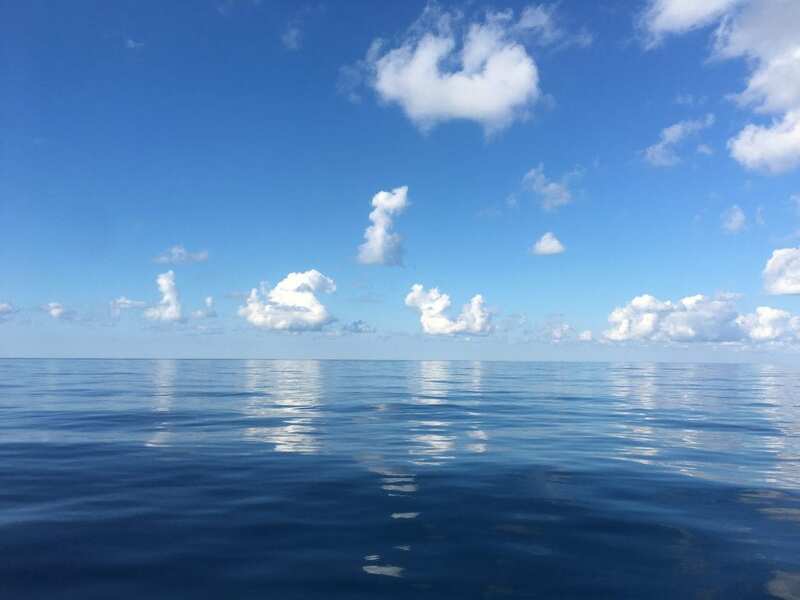 The cruise was mainly comprised of line transects: a series of parallel lines we surveyed that extend southeast from Long Island and reach depths of more than 2000m. Our longest transect line was almost 300km (~185 miles) long! 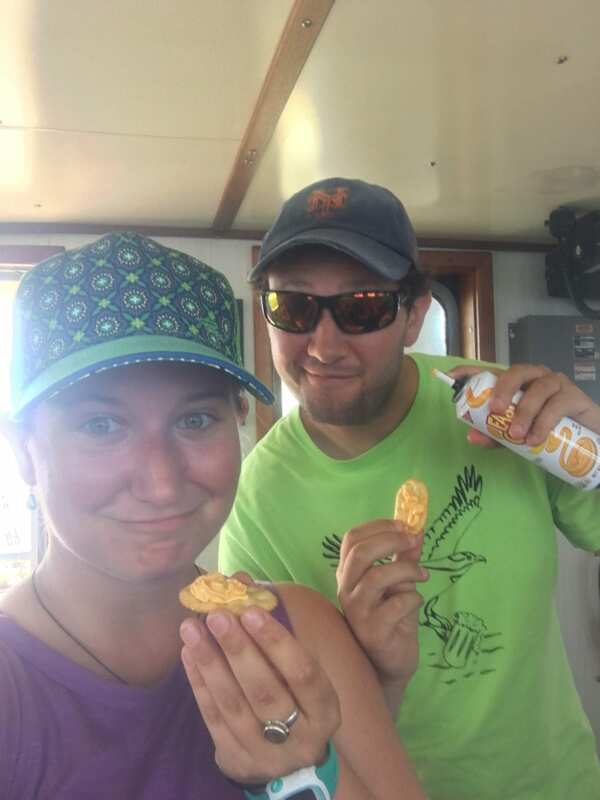 We were able to survey 6 out of 7 of our transects lines on our initial research cruise. 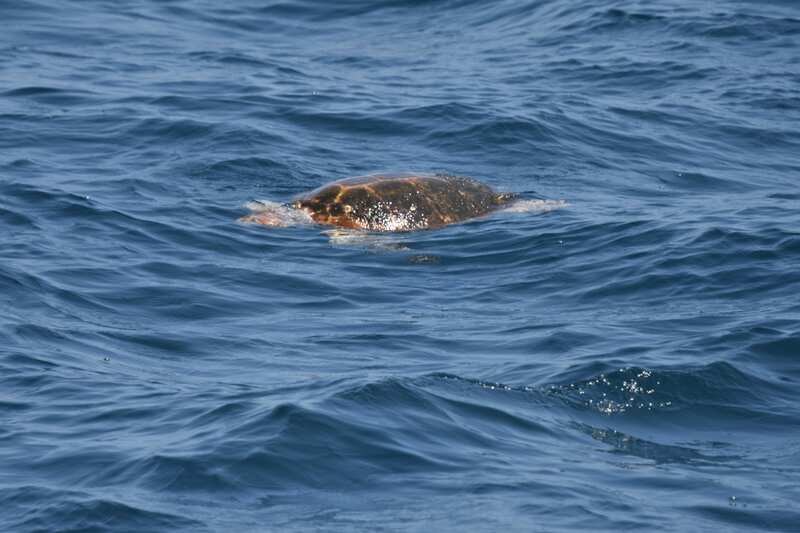 By re-sampling the same lines on future cruises, we can get an idea of the seasonal and spatial distributions of marine mammal species in this region, and are also monitoring sea turtles and ocean sunfish or Mola mola. 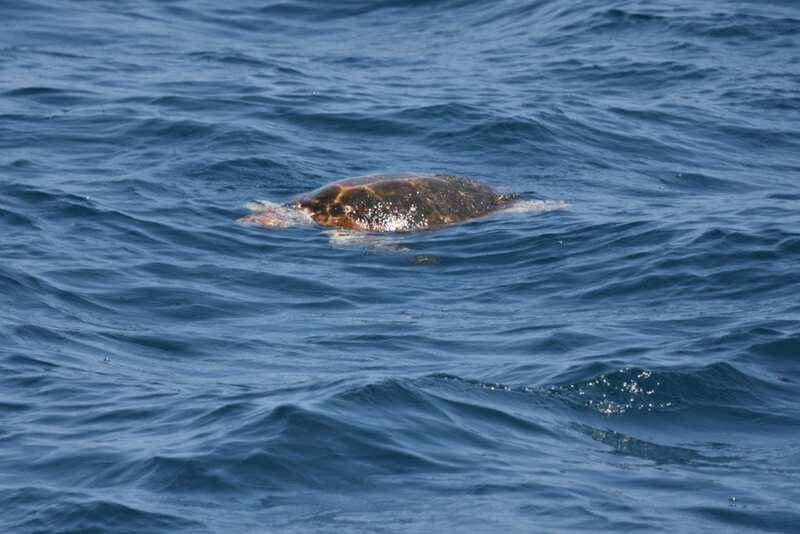 In addition to sightings of whales and dolphins, we recorded sightings of loggerhead sea turtles (pictured here) and ocean sunfish. 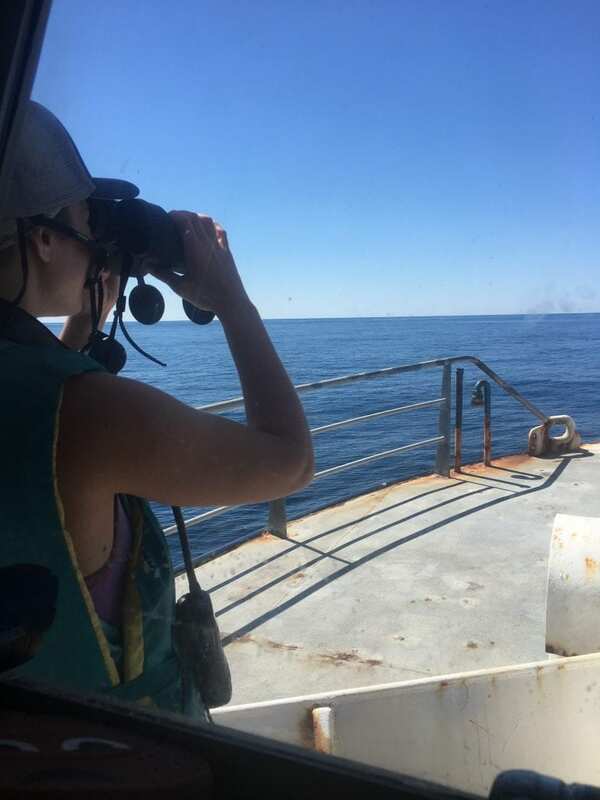 During daylight hours, a team of marine mammal observers conducted standardized line transects for whales and dolphins and recorded their position along with information about group size and species. We regularly rotated shifts so our eyes could take a break from scanning the water. 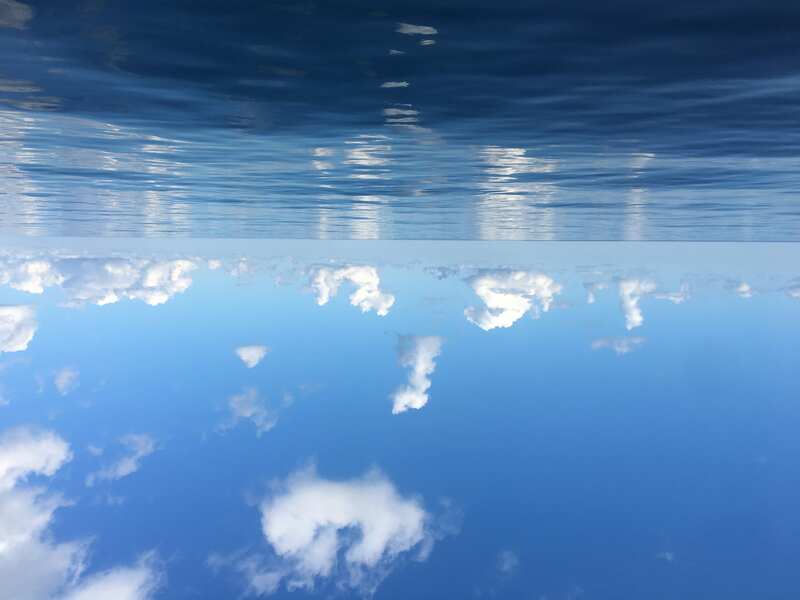 In our off-time, we took water samples for carbonate chemistry and nutrient analyses, looked for any fish schools on the continuously-recording fisheries acoustic instruments (basically like a high-tech sonar), and did CTD casts along the trackline to record physical and chemical data at depth. 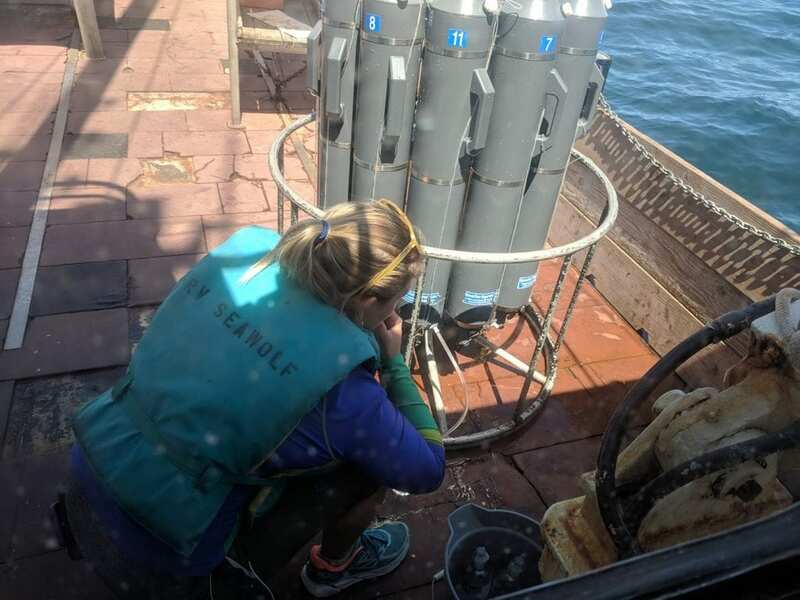 The CTD has water sampling bottles that quickly close at a variety of depth intervals, so we can sample water and conditions and different depths to understand how the different layers of water change and interact over the region. The dry lab setup: Alex Borowicz takes a break from surveying the water for cetaceans and monitors data from fisheries acoustics surveys. We were excited to see so many different marine mammal species on our surveys, and were endlessly lucky to have mostly excellent weather during this initial cruise. An amazing array of species call this region home for at least part of the year. We hope to learn more about their abundance, distribution and residence time in New York during future cruises. Our sightings included several species of dolphin, such as the ubiquitous Bottlenose dolphin, the common dolphin, and even Risso’s dolphin, a deep-water species that is typically covered in scars from interactions with squid, their prey, and other Risso’s dolphins. We had many sightings of humpback whales, from close to shore where they pursue bunker in shallow water, to waters of the outer continental shelf. 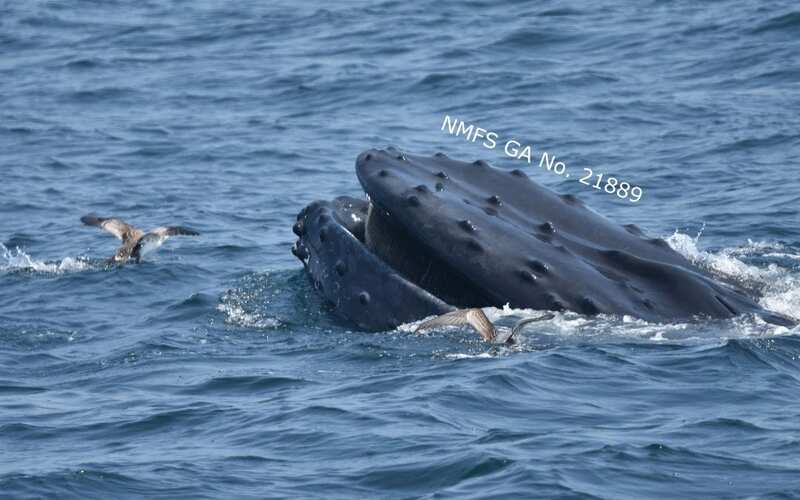 Our sightings included a group of 25+ humpback, fin, and minke whales all feeding on a huge bait ball at the surface! In distant offshore species, our sightings changed considerably. We planned a day of surveying deep waters of the Hudson Canyon (denoted on the map above), where we encountered several deep-diving species – a lone sperm whale, a group of short-finned pilot whales (see the drone footage below! ), Cuvier’s beaked whales, and Risso’s dolphins! Above, a group of Risso’s dolphins. 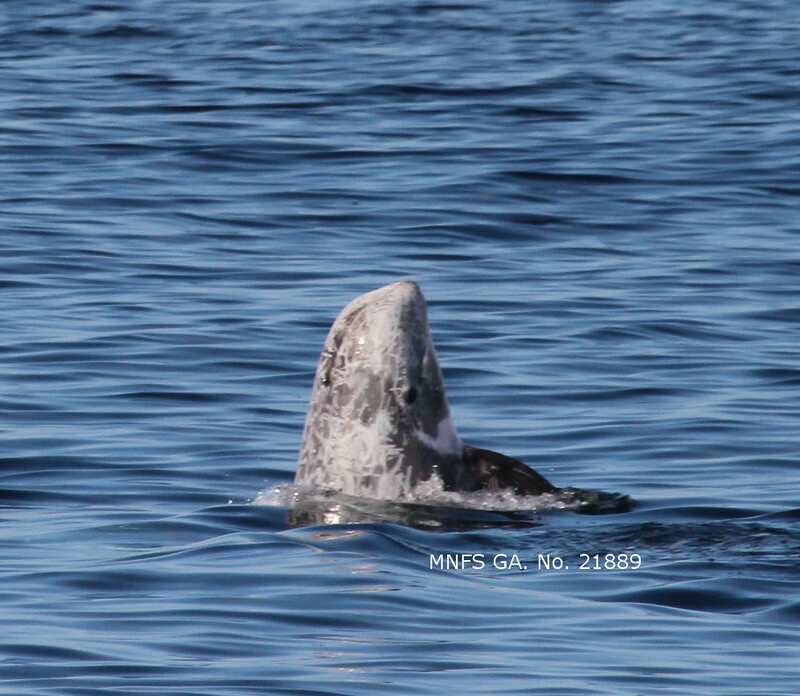 This species often appears light in coloration due to many scars from interactions with squid and other Risso’s dolphins. Above, video of short-finned pilot whales in Hudson Canyon taken from a drone flown by Julia Stepanuk. Video and images from drone flights are being used to confirm the group size and species of pilot whale, which are notoriously difficult to identify to the species level at sea, and to examine humpback whale body condition and foraging behavior. Images taken under a General Authorization for Scientific Research from the National Marine Fisheries Service (LOC No. 21889 to Dr. Lesley Thorne). Conducting surveys for cetaceans is important to understanding and predicting the abundance, distribution and habitat use of these species, Surveys such as this, which took us into distant offshore waters, are important to understanding habitat use in offshore habitats, which typically receive less survey effort. 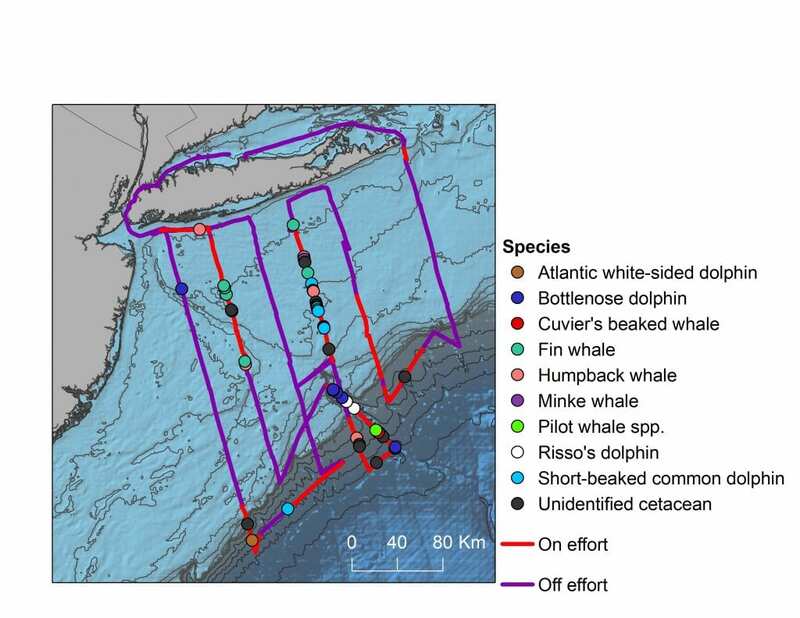 By integrating marine mammal observations together with observations of oceanographic conditions and fish, we hope to learn more about predator-prey interactions and factors driving the distribution of cetaceans in New York waters. This was the first of many of these research cruises that we’ll be running from the R/V Seawolf. Future cruises will be scheduled throughout the year to examine seasonal changes in physical oceanography, fish distributions and marine mammal sightings. An unbelievably gorgeous day at the Hudson Canyon, around 200 km from shore!